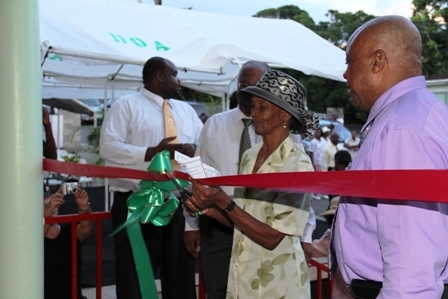 NIA-CHARLESTOWN NEVIS (September 22, 2011) — The community of Barnes Ghaut warmly received its brand new Adult Education Centre with opened arms, when they witnessed its official handing over from the Basic Needs Trust Fund Programme to the Nevis Island Administration early Wednesday evening. 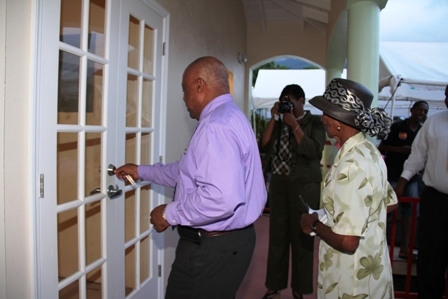 The keys to the new facility were handed over to Social Development Minister in the NIA Hon. Hensley Daniel who in remarks encouraged the members of the community to protect the building and equipment. “We are prepared to work with you, we will send the community workers to the community from time to time, groups will be established to do various things in the communities and we look forward [to doing so]. If I were you living in Barnes Ghaut I would simply say it’s a great time to be alive in Barnes Ghaut,” he said. 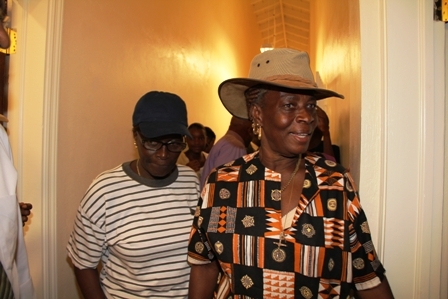 The Minister told those gathered that the NIA had invested heavily in people in an environment where performance mattered and therefore expected the tightly knit community of Barnes Ghaut to lead the way, get involved in the programmes offered at the Centre which best suited their needs, since they had a good sense of the things needed to be done there. He also asked them to bear in mind that the investment was strategic since the NIA believed that money should be invested in facilities it believed would assist with making its social programmes accessible to the people. While he lauded the efforts of the Barnes Ghaut Adult Education Committee in past years, he said their hard work would be enhanced because of the centre which would allow for proper programming. According to Mr. Daniel, outside of the other times the facilities would be available, all the community centres would be opened to the public from 3 o’clock to 7 o’clock to facilitate the 13 programmes offered. He explained that that time frame would facilitate children and young people who had available time on their hands then instead as opposed to them finding options in anti social behaviour elsewhere. He used the occasion to speak to some of the programmes that would be offered at the new Barnes Ghaut Adult Education Centre and the 11 other community centres around the island, among them Computer Education for all ages, Performing Arts training in music, dance and drama, Reading programme for parents and children at the preschool level to ensure a tempo for reading across Nevis. He said there would also be entrepreneurship training in which participants would be taught to do business incubation, development of business plans, financial management and accounting. All the centres would also provide adult and continuing education which would allow them to do Caribbean Examination Council general proficiency subjects in all areas. Mr. Daniel also spoke about the programmes geared toward anti social behaviour. “Given the difficulties we are having in some of our communities with respect to anti social behaviour all of the centres are to have programmes in conflict resolution and anger management and in this one, we have taken the time to craft it carefully. “We have a set of videos which were generated locally to share with the entire population, the kind of difficulties that are being created with anti social behaviour. So in all of the centres we must train our children now to do exactly that,” he said. In addition the centres would also facilitate parenting education programmes because the ability to give birth to children is not to be confused with the ability to manage children. “We recognise that several parents are having difficulty managing their children and so it is our responsibility to ensure that we could provide parenting education. We now do this in a number of communities as the need arises and when we conclude that there are difficulties in particular communities,” he said. Management and leadership training will also be addressed in programmes at the centres to allow for the development of skills in those areas. “So in a nutshell we have 13 programmes which you can take your pick. Every centre does not have to do all of them but certainly you can use them for the enhancement of your community. 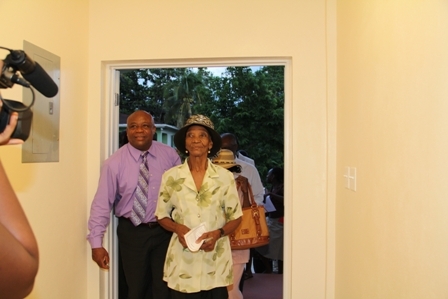 “We believe that these centres are to be the focal points in the community. We now have a situation where several of our communities have become dormitory communities where people leave in the morning and come back and stay in the evening and wake up again in the morning and go to work. 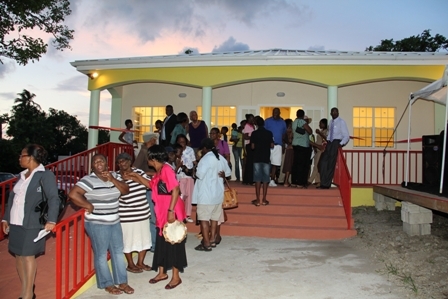 We believe that with the community centres people will have options, people will have choices,” he said.